Air duct cleaning is our profession and we strive to do the best in every circumstance. 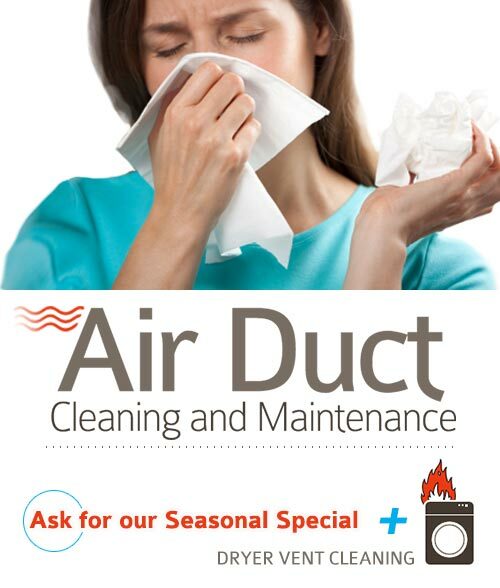 Air duct cleaning is known to improve air circulation within a home and as a result, clear up any respiratory problems facing residents, such as allergies and flu like symptoms. Before jumping into cleaning, we first do a thorough analysis to find out if air duct cleaning is actually needed. Should we find out that it isn't, we inform you and leave without asking for any payment, which means the inspection is totally free of charge. Not a bad deal! >Before even talking about the equipment, we begin the process by analyzing the extent of the ducts in your home. We check the fins, diffusers, and the registers to ensure that they are not clogged with dust. The presence of bacteria and mold poses a serious problem. We eradicate this by using our EPA treatment fluid which also prevents future infection. When it comes to the actual cleaning, we use very unique patented vent and air duct cleaning equipment by initially stirring and then removing the soiled particles from the ducts. Apart from the basic cleaning that every service does, we also clean the coils that are associated with controlling the temperature of the air that passes through your the vents. If air duct cleaning is new to you, this might seem insignificant, but that extra step takes time and attention and is no small feat. However, we want you to remain a lifelong customer, and we hope we can do so by going above and beyond the standard protocols. Order your free inspection today, call us now and our technician will arrive shortly to inspect your ducts 202-683-4270.